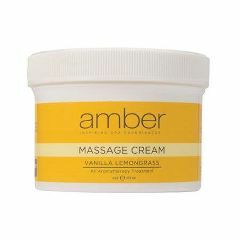 This luxurious massage cream has the warm, sweet, mild aroma of Vanilla known to relieve anxiety, and Lemongrass a natural anti-depressant provide a free radical fighting tonic for the body while boosting your mental health and lifting your spirits! A blend of Soybean Oil, Aloe, and Vitamin E is versatile and can be used over entire body. A rich heavy textured cream base creates an effortless glide for versatile massage techniques. It's non-greasy formulation leaves the skin hydrated and soft. Nut Free.